Gold and silver are currently trapped in a narrowing trading range, copper had a great week until Friday while crude oil has trumped all three – gapping down on each disappointing U.S. jobs report release since May and a dizzying vault to Arab Spring prices as crises rekindle in the Middle East. Is a gold record next? Irrespective of the strengthening U.S. dollar, the value of copper and oil relative to gold reversed in July; the two gaining on the yellow metal like youthful runners in a long race against an aging medal winner. The lustrous one reminds his challengers that pace, not hubris, captures the top spot. Table 1 is a relative value comparison of copper, oil and silver with respect to gold and gives the champion’s claim credence. This table defines Nov. 26, 2010 as a “norm” for comparison (gray cells) because it marks a period when not only gold-to-oil, but gold-to-copper and –silver ratios returned to stable, near historical averages after the extreme volatility of the 2008-2009 financial crisis. Gold ratios conveniently remove currency from the comparisons. Two years before the Great Recession gold lagged the pack. An ounce of the yellow metal traded at a considerable discount (red-shaded cells) to copper and oil, fetching only several hundred pounds of the red metal and 10 barrels of light sweet crude. The day before the first release of three disappointing U.S jobs reports, gold traded at a high premium to both (green-shaded cells); 435 pounds of copper and nearly 16 barrels of oil. Even though copper and oil are presently narrowing the value gap, Friday’s close has increased gold’s lead on the early May numbers to 459 pounds of copper and 17 barrels of oil or 26% and 6% above the historical norm. Gold’s running companion silver tells a very different story. By Friday’s close, the gold-to-silver ratio is just about where it was six years ago at 58 ounces per ounce and 13% above the norm of 51. 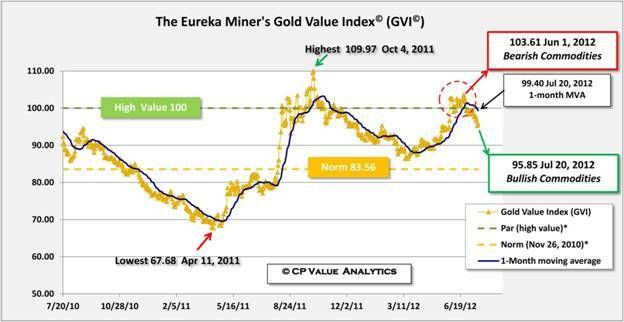 My commentaries use the Eureka Miner’s Gold Value Index© (GVI) to track the relative performance of gold. The GVI computes gold value with respect to copper, oil and silver in much the same manner as the U.S. Dollar Index (DXY) determines the value of the dollar relative to a basket of foreign currencies. An index value of 100 denotes “High Value” (green-dotted line) typically occurring during periods of market stress when investors seek safe-haven in gold and flee equity and commodity markets. Following the August credit downgrade in the U.S., the GVI peaked at 109.97 on Oct. 4, 2011. Conversely, the last round of quantitative easing in the U.S. (a.k.a QE2) inflated the value of oil, copper and silver relative to gold and the GVI reached a bottom of 67.68 on April 11, 2011. Roughly in the middle of these extremes is a level where gold and key commodities approach their more normal historical relation (yellow-dotted line). My May 29 commentary explored a gold value reversal to the upside this spring. The GVI was in slow descent from the October peak toward more normal levels as indicated by the falling one-month moving average (black solid line). The dramatic gap-down of oil prices following a disappointing U.S. jobs report on May 4 heralded a bearish period for commodity prices. Even though dollar-denominated prices fell, gold gained value on its reference commodities. This trend peaked June 1 on the heels of a second dismal U.S. jobs report and the GVI reached 103.61 (red arrow). The current commodity-bullish trend down is shown by the green arrow with the GVI closing Friday at 95.85 below its one-month average of 99.40. Superimposed on the GVI are beginning and end makers for the Great Recession and QE2 as well as three benchmark gold records (yellow boxes) identified in my July 9, commentary. A linear fit of the GVI data is given by the red-dashed trend line together with upper and lower 2-standard deviation bounds (green- and red-dotted lines). The gold value trend is from the lower-left to the upper-right consistent with the tabular data. The Great Recession included several extreme GVI spikes: the greatest occurring on Feb. 17, 2009 at a value of 137.27, a chilling 4.5 standard deviations above trend. The largest downside trend departure was – 1.7 standard deviations and occurred during QE2 as previously noted. The first benchmark gold record was March 17, 2008 when gold value lay below trend and still traded at a discount to all three reference commodities (i.e. below the yellow norm line). The next two benchmarks occurred above trend with gold trading at a premium (above the yellow line). The last of these two was an all-time Comex record of $1,923.7 on Sept. 6, 2011 scoring slightly above the high value 100-level. My July 9 commentary said gold may reach a new record in two to seven months based on July “super-spikes” in the volatility of oil relative to gold - similar super-spikes have occurred prior to each of the three benchmark gold records of Figure 2. The six-year chart suggests the next record will be above both the trend and high value line with gold trading at a premium to copper, oil and silver. The present trend intersects the high value line in six months falling within my prediction window. Although recent trading has pushed gold value below trend and high value this may be transitory and could easily reverse to the upside with renewed market stress. Presently, U.S. dollar-denominated gold price is looking for a catalyst to break out: lackluster physical demand and the dog days of summer have put pressure on gold in a strong U.S. dollar environment; recent rate cuts in China and Europe and the possibility of further quantitative easing in the U.S. are gold supportive. Caught between this dipole, the yellow metal will most likely wander about the center of its range until a new catalyst appears on the horizon. Either negative market anticipation of the U.S. “fiscal cliff” or a conflict in the Persian Gulf could provide the catalyst for new highs or a new record. The probable timing for such horrific shocks to the global economy eerily coincides with my gold record window. As much as the six-year value trend is the gold investor’s friend, I pray this prediction is folly. Note 1: The Nov. 26, 2010 “norm” Comex/Nymex values are taken the morning after Thanksgiving that year, all other table entries are closing prices for the respective dates. Note 2: A 10-year history of gold-to-copper ratios and is volatile but the cited 363 pounds per ounce is close to the midpoint over that period when the short and violent spikes in late-2008 and early-2009 are excluded. From 2002 to 2004 the ratio bounces between 290 and 500 pounds per ounce. It trends down from that spread to 2006 and then remains range-bound between 170 and 290 pound per ounce from 2006 through Q3 2008. At the height of the financial crisis the ratio peaked to 621 pounds per ounce on Feb. 20, 2009; after the Aug. 5, 2011 U.S. debt downgrade, the ratio has stubbornly stayed above 400. 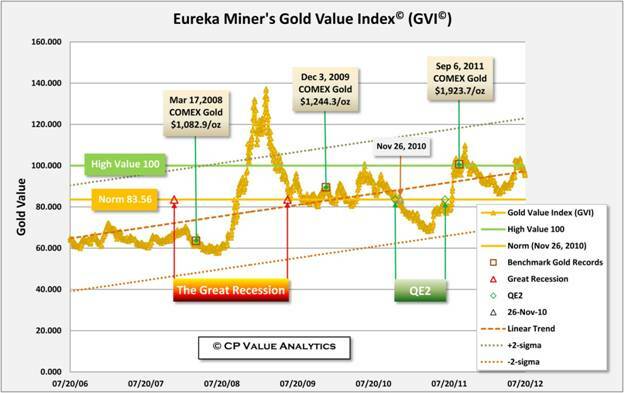 Note 3: A GVI of 100 represents a “High Value” benchmark for gold (dashed green line in Figure 1) set June 7, 2010 when the DOW closed below the intraday low of the 2010 “Flash Crash.” A “Norm” value of 83.56 set the morning of Nov. 26, 2010 (dashed yellow line) denotes gold trading with respect to its reference commodities in a historically normal relation.